Sarge Johnson of the Harlem Globetrotters does a flip during a game against the Washington Generals at the Verizon Center in Washington in 2011. Let’s first get a sense for how good the Globetrotters were. How have they performed in competitive games. Wait, the Globetrotters sometimes played serious basketball? Yes — from 2000 to 2003 they played a series of games against NCAA teams. (The NCAA banned the practice in 2004.) News accounts of these games insist that they were taken seriously by both the Globetrotters and their NCAA opponents. As best as I can tell — statistical records for anything involving the Globetrotters are sketchy — they went 13-9 in games against Division I opponents while winning by an average of about five points per game. This is reasonably impressive. As a barnstorming team, all of the Globetrotters’ games were played on the road, and some of their opponents were pretty good: Michigan State, Syracuse, Connecticut and so on. 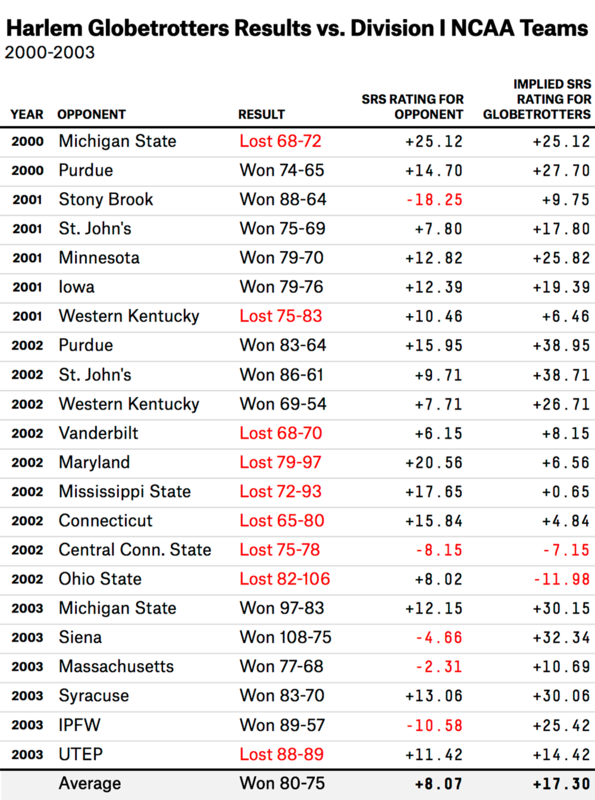 We can come to an estimate of the Globetrotters’ strength by looking up the SRS rating of their college opponents. SRS (Simple Rating System) is a Sports-Reference.com invention which accounts for a team’s margin of victory and strength of schedule. A team’s SRS rating represents how much it would outscore (or be outscored by) an average opponent from its league. Take one of the Globetrotters’ opponents from 2001, the Iowa Hawkeyes. The Hawkeyes had an SRS rating of about +12 that season, which implies they’d beat an average Division I team by a dozen points. But the Globetrotters beat Iowa by three points. Furthermore, the game was on the road, and home-court advantage is worth about four points in college basketball. So to get an SRS rating for the Globetrotters, we start with Iowa’s rating of +12, then add three points for the Globetrotters’ margin of victory, and four more since the Globetrotters were playing on the road. The Globetrotters come out with an SRS of about +17 based on our sample. That’s pretty good — it’s similar to the SRS rating that Syracuse, Ohio State, Baylor, Wichita State and the national champion Connecticut Huskies had last season. If they entered the NCAA tournament, the Globetrotters would deserve to be slotted in as something like a No. 4 or 5 seed. Let’s return to the case of the Generals. In Posnanski’s accounting, the Generals usually played straight up on offense. And they played straight up on defense about 40 percent of the time. The other 60 percent of the time, when the Globetrotters were in one of their “reams” (trick-play routines), the Generals’ job was to play the stooge and ensure the Globetrotters looked good. We know that when playing straight-up basketball, the Globetrotters are equivalent to a No. 4 or 5 seed in the NCAA tournament. Per Ken Pomeroy’s data, a team like that would expect to score about 1.13 points per possession against an average NCAA opponent and allow 0.97 points per possession. But the Generals are probably slightly worse than an average NCAA team; most of their current roster either played for middling Division I schools or didn’t play in Division I at all. So let’s tweak the Globetrotters’ projected offense up slightly to 1.15 points scored per possession, and their defense to 0.95 points allowed per possession in straight-up play against the Generals. Let’s guess that Globetrotters games feature an average of 55 possessions per team, lower than the rate of about 65 possessions per team for an average NCAA game. From what I can tell, Globetrotters games generally last 40 minutes — the same as in college basketball. But team also plays without a shot clock, and its routines can last for minutes at a time (while violating all other sorts of basketball rules). Based on these assumptions, if the Globetrotters and Generals played straight-up basketball, the Globetrotters would win by an average score of 63-52. (You can get to these numbers by multiplying each team’s points per possession by 55 possessions per game.) This would translate into their beating the Generals 94 percent of the time by basketball’s Pythagorean formula. Had the Generals played to win on every possession, Klotz would have finished with a career record of about 840 and 12,166. That’s … not great. But it gives Klotz about 834 more wins. As a gut check on this back-of-the-envelope calculation, let’s account for what happens when the Globetrotters employ a trick play, as they did 60 percent of the time in Posnanski’s estimation. Let’s assume that their scoring efficiency in these cases is two points per possession, equivalent to scoring a two-point field goal every time down the court. In practice, the Globetrotters no doubt miss some baskets, even when the Generals are laying down to them. But they could also boost their scoring efficiency through 3-pointers (and in the Globetrotters’ case, 4-pointers!) and offensive rebounds. Scoring 1.15 points per possession 40 percent of the time (when playing straight up) and two points per possession 60 percent of the time (in trick-play mode) yields an overall average of 1.66 points per possession. In a 50-possession game, that would make the average score 91-52 in favor of the Globetrotters. That implies the Globetrotters would beat the Generals 99.96 percent of the time per the Pythagorean formula — exactly their historical winning percentage against them.